5 way to balance your hormones. 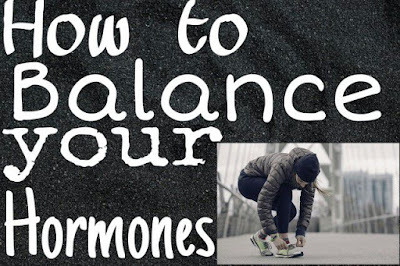 The most important topic for every one who wants good health and wants to achieve any health goals, for that balance your hormones.I tell you 5 way balance your hormones. hormones are tiny chemical messengers the travels throughout our bodies delivering messages to our organs tissues they regulate growth, metabolism, big muscle, distress and affect many aspects of our overall health. hormones are secreted by various glands and organs including thyroid, adrenal, pituitary, ovaries,testicles and pancreas. the entire endocrine system works together to control the level of hormones circulating throughout our body and if one or more is slightly imbalanced it can cause major health problems. acne,facial hair and low libido. The body can make hormones when it doesn't have the proper building block our body needs various types of fats to create hormones this has help in hormone production reduce inflammation boost metabolism and promote weight loss coconut oil extra virgin,olive oil and avocados are some of the best source of healthy fat try to incorporate vegetables and the body needs phytonutrients to break down extra hormones that are not in use avoid processed foods as they are filled with neurotoxins and endocrine disruptors. 2.Keep away from toxic products. Household cleaners,pesticides,plastic, and even beauty products can contain toxins that can disrupt the body's hormone function by mimicking natural hormones and preventing production of real hormones,avoid any product that contain parabens,BPA and Tallis remove fluoride from water and food products as fluoride calcified. The pineal gland which lead to dementia and alzhiemer's another thing to consider is use of plastic bottles and aluminum containers, it is best to replace plastic with glass and stainless steel because of toxic effects of BPA which from step one pass to stainless steel that I make our cast iron which can make a big difference in the amount of chemicals getting into the food you prepare. 3.Reduce stress and get more sleep. Research tells us that hormones follow a schedule cortisol,the primary stress hormone is regulated at midnight therefore people who go to bed late never truly get a break from the stress response sleep helps keep stress hormones balance build energy and allow the body to recover properly to maximize hormone function try to go to bed early and stick with a regular sleep wake cycle as much as possible. your brain produces hormones ,it can elevate cartas all levels and impact other stress hormones such as adrenaline.caffeine has been shown to increase insulin levels and reduce insulin sensitivity limit to one or two servings a day and try to substitute them with herbal and decaffeinated teas to make sure your hormones are balanced. Exercise and physical activity are vital for hormone balance,exercise is good for balancing hormones because it reduces inflammation can help you maintain a healthy weight,lower stress,helps regulate your appetite and aids in getting better sleep. exercise can also enhance immune system allows cells to take up more glucose which lowers insulin protect from depression and keep you more alert without the need of caffeine,for people with hormone imbalances do regular exercise to balance the hormones without any cost. I hope you will understand how to balance you hormone imbalance with naturally and safely.